Oh my gosh. Yes, I totally agree. I think what you’re saying is you like authenticity. Me too 🙂 And the ‘small words to talk about big things’ that you mentioned is the vision I have for my blog (on the most part). I want to approach topics in my poetry and art in a simple way, but would/could cause people to think on a deeper level. So yes, that totally makes sense. Most definitely AO. ‘To love and be loved’ is a great way to put it. After all, humans a relational beings and need relationship/connection. Thank you so much and have a wonderful day. p.s. I was traveling and had little internet access. That’s why I’ve been missing in action. I’m heading over to your blog now to see what you’ve been up to. “Ordinary moments hold more than one can see”. Yes, we’re often blinded by the garish light of technology. Beautiful words, Staci! Simplicity means beauty to me. The wonder of life, from the simplest flower, to a hummingbird in the garden, dinner with family and friends, and a simple, lazy strum on my guitar under moonlight. Bliss. Thank you so much, my friend. Have a great Thursday. Awwww, thanks Richard. I can’t believe this comment didn’t show up in my notifications. So sorry for the late response. A simply beautiful poem, Staci. Ohhh, hahaha. Thank you so much David. It’s just a ‘simple’ (pun intended) little one. I actually wrote it quite a while back. I wanted to put it into some of my own art. Blessings to you and Happy New Year. At the outset Staci, welcome back in 2016 after a long hiatus, I visited couple of times and was wondering what happened and where are you. Today itself I was checking and this is serendipity. Hope everything is fine at your end. 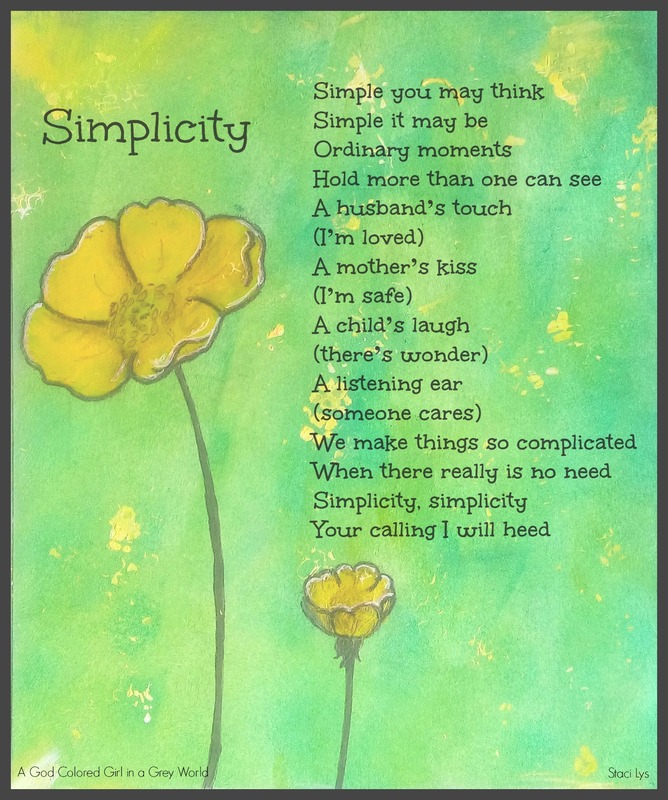 I couldn’t agreed more on the choice of word “Simplicity”, it is well said the most “Simplicity is the highest form of Sophistication.” Life by nature is complex and we are taught how to live simple life and keep high thinking. Beautifully said simplicity lies in the art of listening and rarely do we lend our ear and so much is possible and so much can be achieved just by being a good listener and with increasing cacophony around us and the impulsive nature we have developed with rapid change happening all round. Yes, the tender touch or a gentle pat makes all the difference, but we forget in doing in the simple things and keep looking at the complexity and attempt to design compounded solutions to solve the simple things in life. The problem is in our thinking, it has become complex and we want to live simple life but keep thinking in the intricacies of living. The power of life and living truly lies in the word “Simplicity”, indeed living the ordinary moments in simple ways can make the extraordinary changes in our life. Ohhhhh, hello my friend Nihar. I actually opened up to your blog, although I haven’t read your most recent post yet. I will be sure to get to it right after this comment. Happy New Year to you. I hope you had a beautiful Christmas and New Year’s with family and friend. I also wish you all the best for 2016. May it be filled with love, light and truth. Yes, simplicity, you said it well. We do complicate things far too often in our minds. One thing too, I think we make things complicated when our values and principles are in the ‘un-natural’ things of life. Like materialism and social status. I’ve thrown ostentatiousness out the window, as well as working overtime to get ahead, or simply earn a few extra bucks (which soon sprout wings and fly away). So great to see you here Nihar, and please have a beautiful weekend. It’s great to be back Nihar. Yes, this is true. Learning and living and understanding through experience and all too. I was just over at your blog. Great post. I’ve left a comment for the start of, I’m sure, a great conversation. Ohhhh, you are such a blessing to me Sibella. Thank you so much for your gracious words and appreciation. Awwww, thank you so much Sibella. Awwwwww Lorrie. You always know how to brighten up my day. Thank you so much for your sweet words and encouragement. Hahahaha. That’s great Carisa. Yes, that is simplicity at its best. Thank you so much, my friend. I’m so glad you enjoyed this. You’re so sweet. Thank you so much Carissa. As are you sweetie. Nice. Love the picture too. Thank you. Thanks so much Rob. So glad you enjoyed it. Oh my gosh. Hiiiiiiiii Zee. You know, I just saw this comment now. For some reason I’m not getting a lot of comments in my notifications. Thank you so much Zee. And I agree. Sometimes we do get too caught up in such unimportant things. I love simplicity. I hope you are having a wonderful weekend, my friend. It is wonderful to be back and blogging again. Hi Bernard. Thank you so much for your comment. I’m so sorry I don’t speak French, but I used the Google translate to read it. Oh wow. You are so sweet Saaransh. Thank you so much for your kindness and appreciation of my simple (no pun intended – hehehe) art and writing. And I love that you used the word ‘organic’ for the green and yellow. Mesmerising…to express simplicity in simple words. Thank you so much. What a great thing to say. I love the simple. Thank you so much. I like that -‘first kiss of the morning’. Absolutely beautiful Staci! The simple acts you described are so calming in this complicated and chaotic world. Those simple things restores self worth in oneself, and then ripples out to others. We really do make things so complicated. So important to nurture those simple acts of kindness. Ohhhh, thank you so much Carl. I’m all for simplicity. Living here in Brazil, and as a missionary, makes simple living so much easier. I love it. Have a wonderful Sunday and week ahead. NICE! My wife was an MK in India, and I was a simple farm kid growing up, so we have worked at trying to keep our lives simple as well. Life really is so much easier!. Simple is the way to go. I wouldn’t have it any other way. It really is better, isn’t it? You have a great week too Carl. Thank you so much Vashti. So glad you like this, and agree. Hope you have a ‘simply’ wonderful Sunday. Sounds great to me Heather. Thanks for sharing, and have a great Sunday. Btw, here in Brazil tonight there’s going to be a program on TV about people with Asperger’s that also have a touch of genius. Looking forward to watching it. Love your artwork and the beautiful thoughts that come with it. Awww, thank you so much Tosha. I’m so glad you enjoyed this. Thank you so much Elizabeth. It’s so great to be back. Trying to get back into routine, but it’s a bit tough while school is still out. And I think school won’t start up again until Carnival is over (after the second week of February). Don’t you think it’s funny that I don’t even know when school is going to start. Hahaha. Brazil is a little more laid back than Canada. Hahaha. Oh yes, yellow. I also relate yellow to happiness, or cheeriness. Like the sun. Have a great Sunday Elizabeth. Yes, most of the time they are, aren’t they Indah. So great to hear from you. Hope you’re enjoying Minnesota. Thanks so much for appreciating and commenting on my poem Indah. Here here to that. Hope you are doing well friend. Exactly. Who needs complicated? Hehe. Thank you so much Ameena. I’m so glad you ‘love’ this. Hi Staci! beautiful poem and very relevant thoughts :)Simplicity is much needed in today’s world as things are getting more n more complicated whether it’s food,lifestyle,decor,devices n all.I believe ‘simple living and high thinking ‘ is the mantra which can empower mankind to live in harmony with nature . Thank you, once again, and I look forward to checking out your blog too. Hi again..it is so nice to know that you n your family follow a simple life style.Our thoughts match on quite a lot of issues..so glad to have found you in blogosphere .I am myself not a great admirer of city life…I find all the hustle bustle too jarring to my senses..I prefer living close to nature n am most blissful then.Luckily at present I am living in the suburbs with almost 50 acres of jungle around my residence..and I really love the peace n positive energy of the trees n greenery.I try to follow ecologically sustainable lifestyle as much as possible …this is really the healthiest way….need of big buildings,gadgets n artificial foods are all unreal wants created in human minds by the big consumer-goods giants for material gains playing havoc with health n peace of humans. That is awesome that you live surrounded by jungle. Wonderful. I live in a place surrounded by beauty and nature as well. I am very close to urban areas, but my home is like a tropical little haven. Ahhhhh. Awww, thanks. It definitely helps. You have a nice time too, my friend. I love simplicity! that’s what makes life so special 🙂 and beautiful post Staci! Oh yes, so true. Thank you so much Neha. Oh I totally agree Crystal. A simple life is a fulfilling life. Thank you so much Heena. I’m son glad you like this one. Simplicity is the best, isn’t it. And I love that @ no prettiness, no complications. Agreed. Turns out, the simplest things are also the most profound. Hope it’s a great year, S.
Heyyyyy, I was just thinking about you today. Talk about serendipity. How are you? Life is soooooo busy. The school year starts on February 15th. We were on holiday, and now I’m trying to ease Caue slowly back into reading and all. It’s all about process with him. Hahaha. You got that righ, simplicity often translates for what we take for granted in some cases. And when stripped of those things, then you really realise that that simplicity was actually the world. So yes, treasure the “small” things. Exactly. Poignant observation Sir Charly. Hehehe.